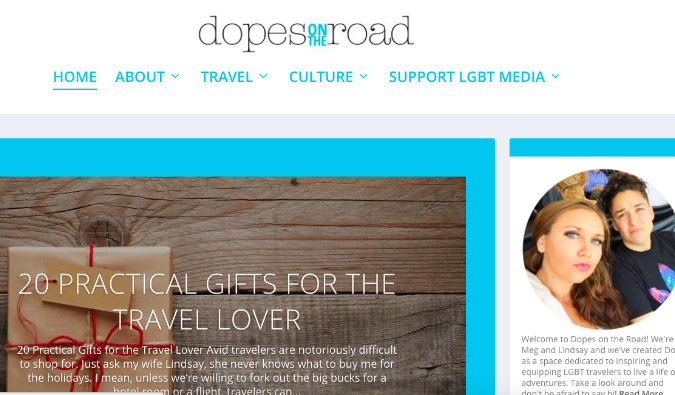 I’ve added an LGBT column to the website to make the site is more inclusive and talks about issues that affect some members of our travel community. 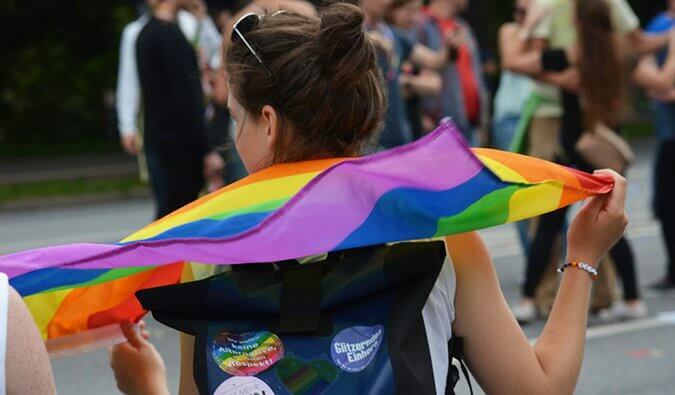 In this column, we will hear from voices in the LGBT community about their experiences on the road, safety tips, events, and overall advice for other LGBT travelers. 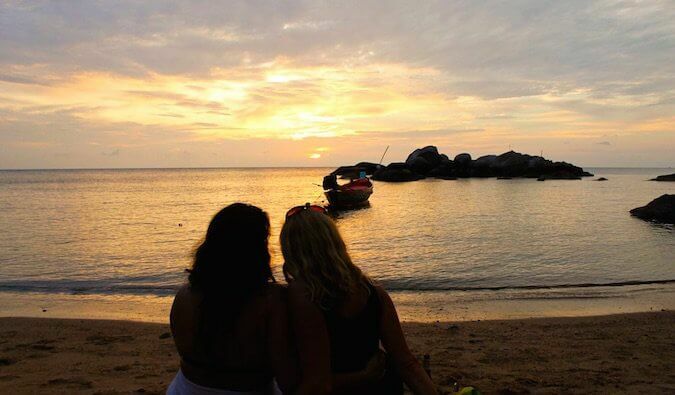 This week, Dani from Globetrottergirls shares some of her favorite lesbian travel blogs. 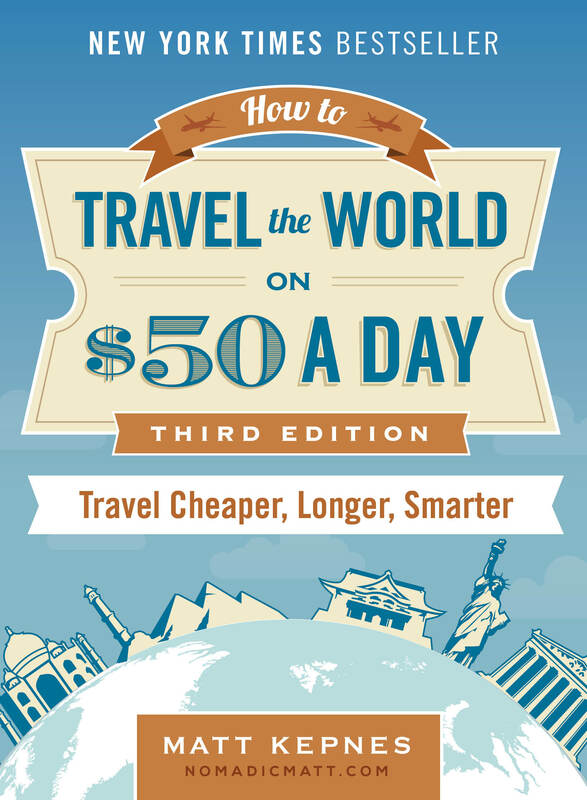 Ever since I started traveling full-time in 2010, I’ve been an avid blog reader. 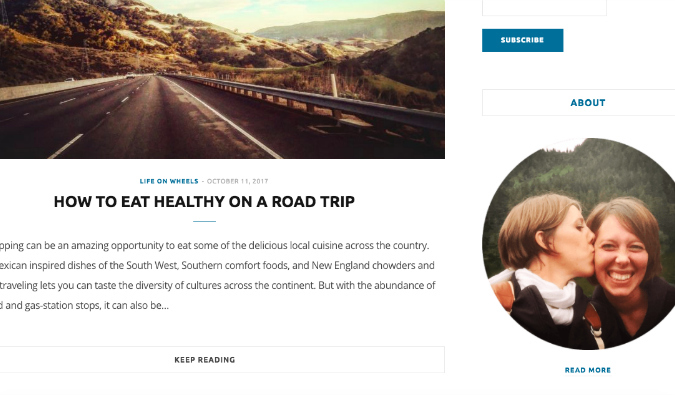 I am subscribed to dozens of blogs, and I have visited countless places after finding out about them on blogs. Boracay in the Philippines, for example — I read about it on blogs. Or Las Lajas in Colombia, which I visited this year, seven years after learning about it through a travel blog. The charming French town of Colmar? I am now keen to visit it after it popped up on several blogs I read. 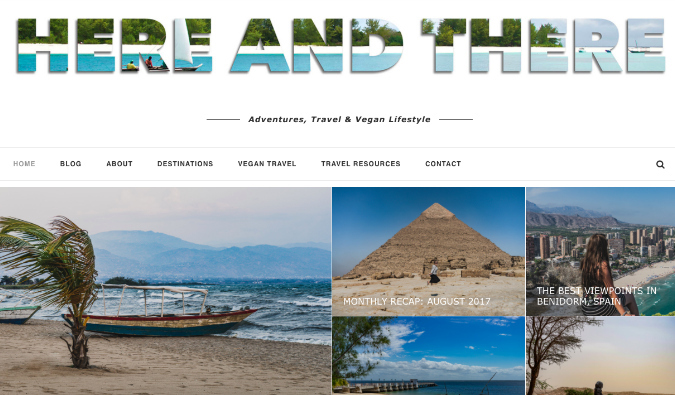 Without travel blogs, I would have never found out about these places. The same goes for cafés and restaurants, ice cream shops and bars, small art galleries, and great hostels. 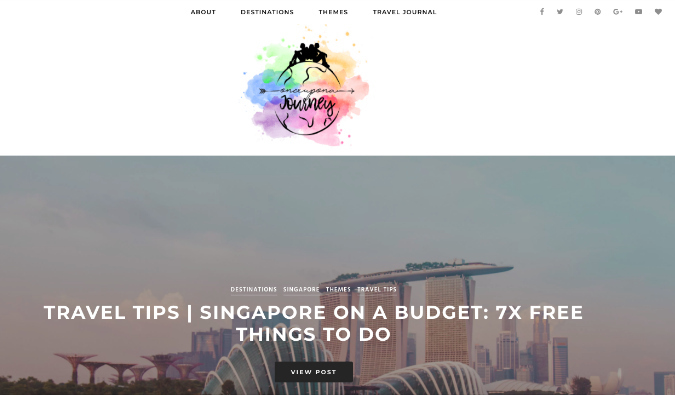 I read blogs for travel inspiration all the time, but also for travel tips when I research a destination I am planning to visit. 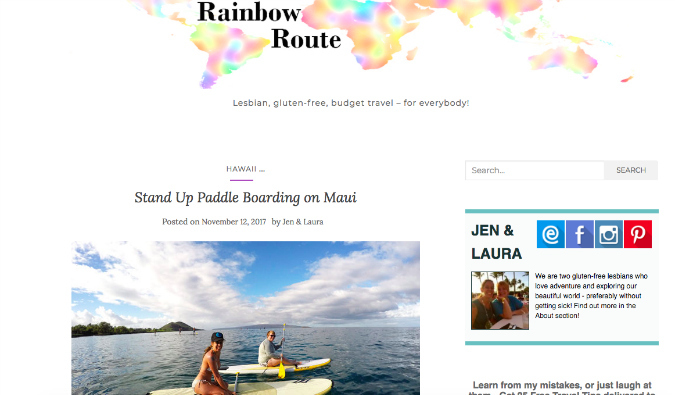 While there are dozens of couples’ travel blogs, solo female travel blogs, and a fair number of gay travel blogs, there have never been many lesbian travel blogs. At least, until recently! 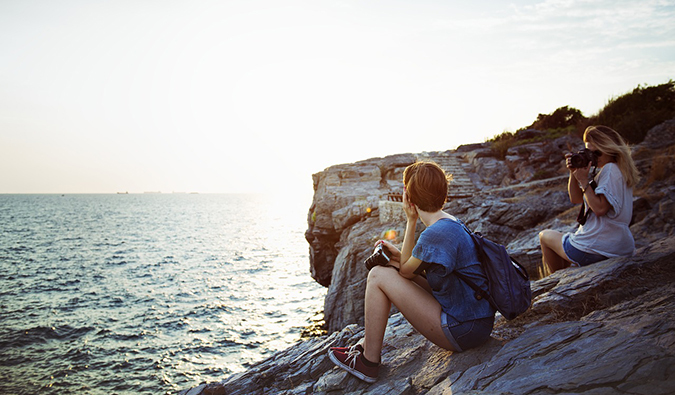 It seems that in the last year or two, there are a lot more people that are selling everything they own to go traveling, and that is also true in the lesbian world. 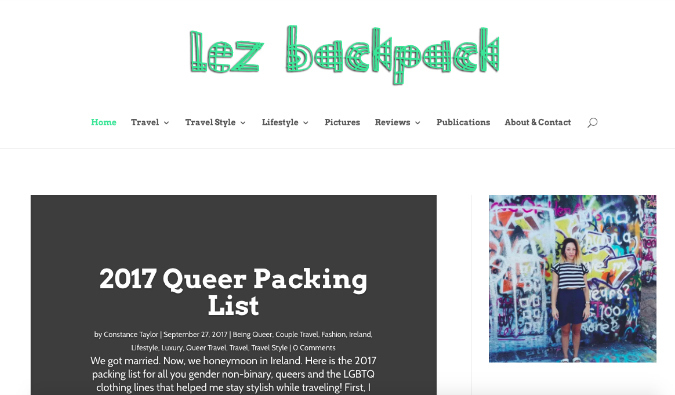 For years, the L in LGBT travel blogs was filled by only a handful of blogs, but there has been an explosion of lesbian travel blogs recently and I am excited to see the lesbian travel blogosphere expand. These girls have inspired me with their stories about off-the-beaten-path destinations such as Bahrain and Cuba, piqued my interest in destination weddings, and made me consider spending all my savings on a campervan and heading out on the open road. Mari (from LA) and Zoey (from England) were each backpacking through Southeast Asia when their paths crossed in Bangkok, and they have been inseparable ever since. Recommended entry: All of the articles in their “Being Queer In…” series, including the Philippines, Vietnam, South Korea, and Thailand. 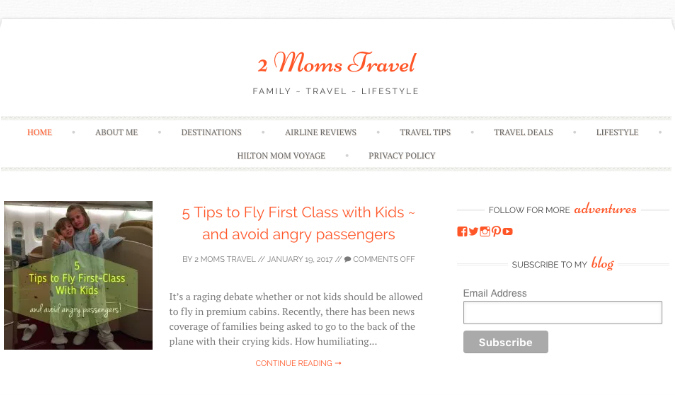 Lara and her wife Deb travel with their two kids, showing that it is possible to travel with young children. Prue, a photographer from Australia, and Becky, a travel writer from England, have been traveling the world together since 2012, when they met in Thailand. Jen lives in Vancouver with her wife Laura. They travel together as a couple, but Jen also takes plenty of solo trips. Their wanderlust has brought them to places like Central America, New Zealand, Japan, Australia and Europe. 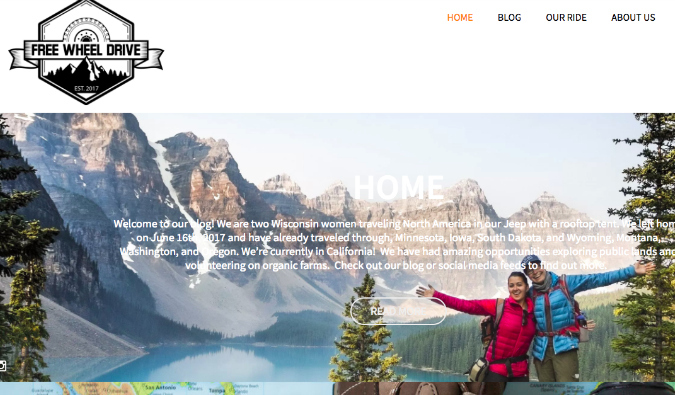 Laura and Camrin are two girls from Wisconsin who, in June 2017, packed up everything they could fit into their Jeep Grand Cherokee named Tina and started traveling around North America while working remotely. 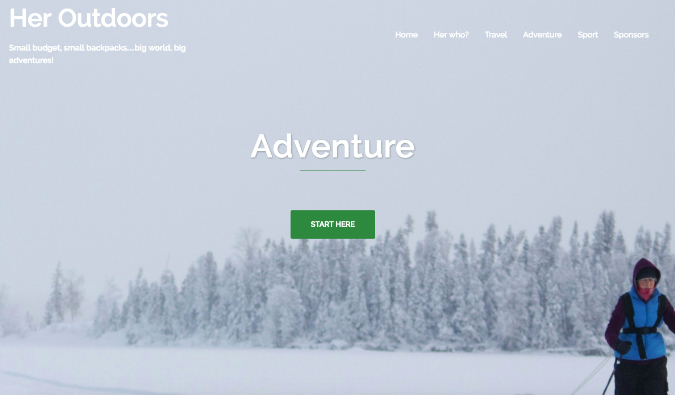 Their plan is to hit up as many national parks as possible, to couchsurf, to housesit, to use WWOOF (to work on organic farms), and to see how far they can get while traveling on a budget. The Vagabroads are Sunny, a former criminal defense attorney, and Karin, who used to be a network engineer. The couple, who hail from Nashville, TN, sold all of their possessions to go on an indefinite overland journey down the Pan-American Highway through the US, Mexico, and Central and South America. 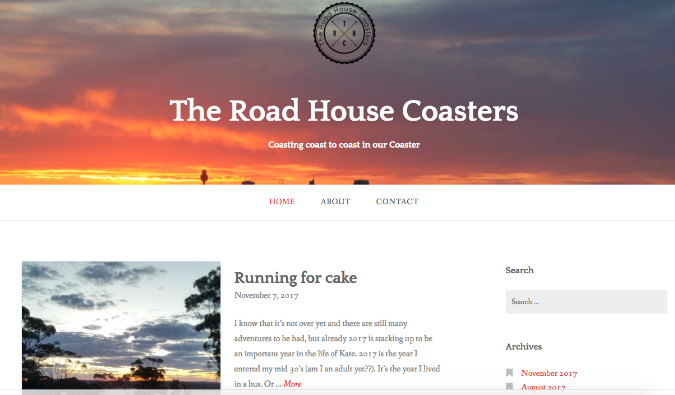 Kat and Jot are a British couple who met at university and moved to Australia together. They recently sold everything they owned and bought a bus to travel. Roxanne and Maartje are two gorgeous blondes from the Netherlands who shared a dream of traveling the world together. In March 2017, they made their dream a reality, starting their journey in Russia with an epic train trip: the Trans-Siberian Express all the way to China. The girls are in Southeast Asia now and are planning to head to New Zealand next. Victoria, a Brit, and Elaina, an Aussie, met at work in Australia. 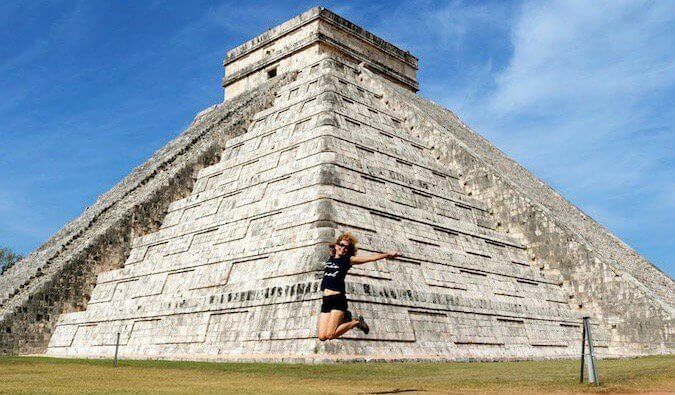 They quit their corporate jobs in 2014 and have been traveling ever since. So far, they’ve visited 39 countries together. Meg Cale and her wife Lindsay met online, dated long-distance while Meg was teaching in South Korea and Lindsay was in the United States, and finally got married last year. Recommended entry: “We Eloped: Yup, Lindsay and I Got Married in Ecuador,” about their South American destination wedding. Valerie and Jessi are a lesbian couple roaming the US in a teardrop camper mini RV. 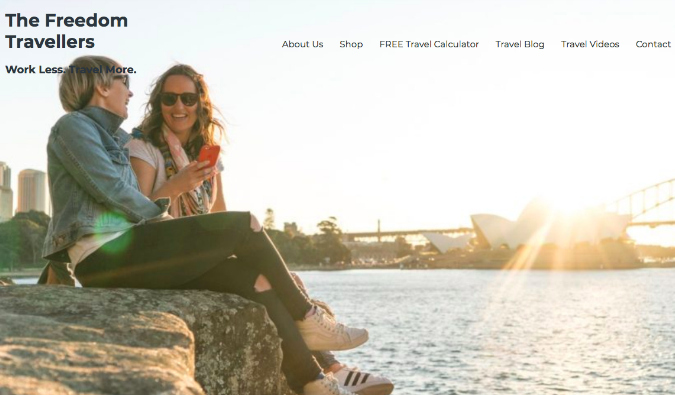 Alison and Helene are two thirty-somethings from the UK who are traveling the world after quitting their jobs and selling everything they own. Gabriela is an adventurer who has been traveling full-time since 2016 and is on a quest to visit every country in the world. Her current country count is 77! Melissa chronicles her life and travels with her wife Constance. 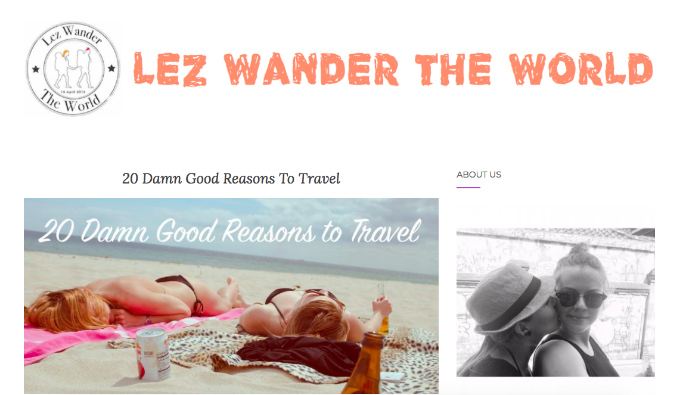 I am excited to see the growing number of wanderlust-inducing lesbian travel blogs. All these blogs show though that there is always room for quality content on the internet, and there are still not enough lesbian voices out there. 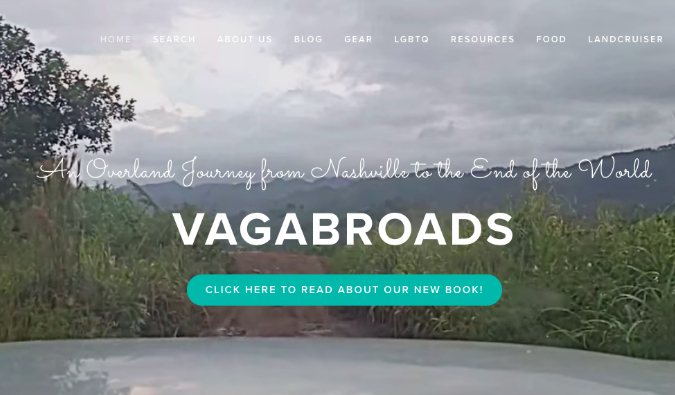 If you’re an LGBT traveler, I hope these blogs provide the inspiration and advice you need. 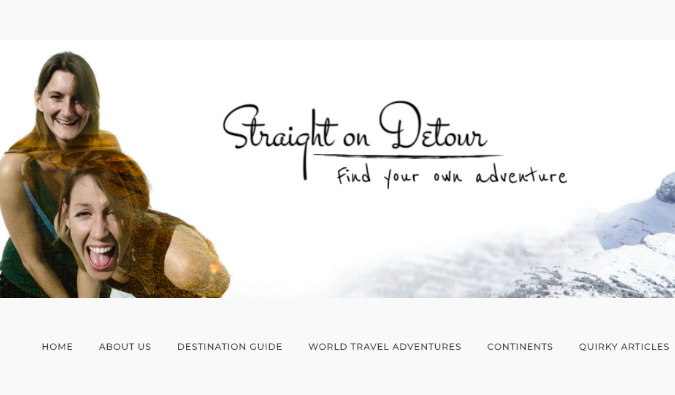 And if you’re not an LGBT traveler, these websites are still fun and informative to read! Dani Heinrich is the vagabonding writer and photographer behind GlobetrotterGirls.com. Originally from Germany, she has been nomadic since 2010, when she quit her corporate job and embarked on a round-the-world-trip. She has travelled through over 60 countries on four continents and has no plans to stop any time soon! You can also follow her adventures on Instagram, Facebook and Twitter. I’ve given up looking at anything labelled “LGBT” in the travel world, because 99.9% of it is for gay men. Which is great! – for them. But there are just so many lesbian-tolerant bear bars I can go to before it starts to feel awkward. Gosh, why did noone ever thought of making a list for that? Awesome selection and such an interesting niche.